I’m so happy to be blogging that my new cladding for all four Moregeous Mansions dormers is arriving tomorrow! It’s felt like a long winter but we’ve survived it and now it’s time to get cracking again with the three remaining ‘outside’ things – the cladding, the bi-folds and the garage door. I have AGONISED over what to clad the dormers in. Constructed out of timber and externally lined with OSB then roofing membrane, I’ve kept standing in the garden, cricking my neck and imagining different types of materials and finishes on their outsides. 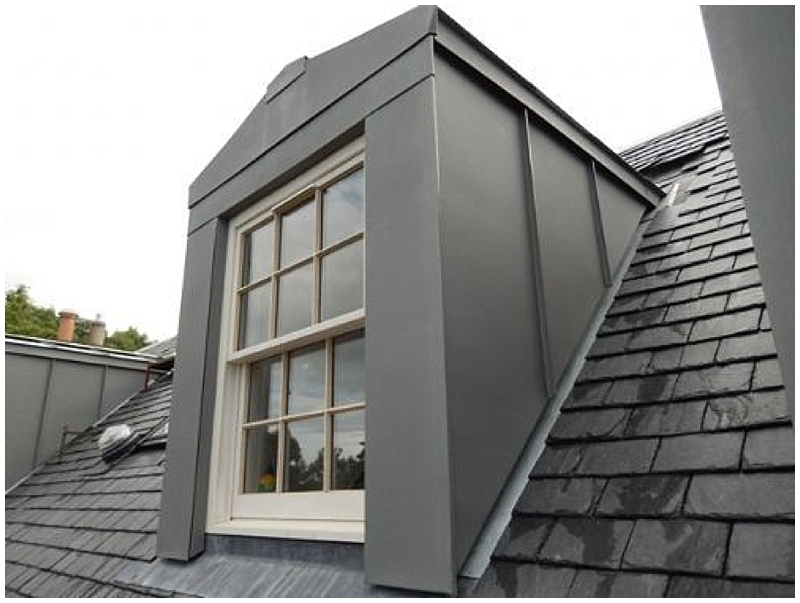 Slate, timber, GRP, metal – all with different pros & cons and very different looks. I needed something to sit well with the tradtitonal aspect of our build, the salvaged slates, the fishtail pattern of the roof and the reclaimed bricks, but also something to give a contemporary edge and compliment with my Railings paint, contemporary bi-folds and what will be a very unique interior. 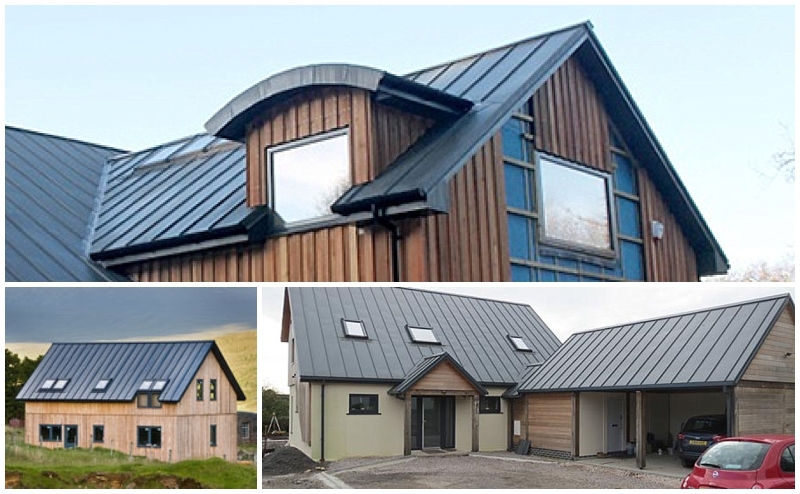 I’ve decided on the finish pictured below called ColorCoat Urban by Tata Steel, a powder coated steel based product with a modern looking standing seam, good environmental credentials, a 40yr guarantee and best of all it comes in the deep grey shade so beloved at the moment – Anthracite. I had four greys to pick from and have opted for the far left – right choice do you think? The others look a bit pale next to my reclaimed slates, I think. 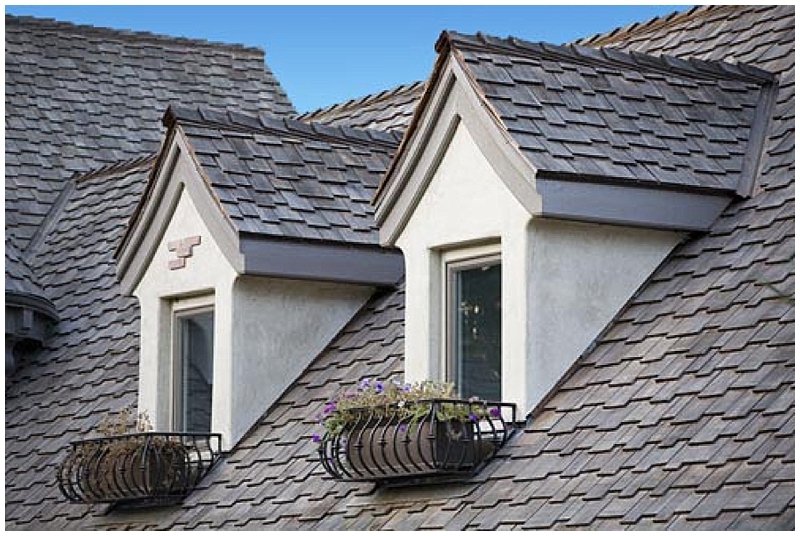 Slate clad dormers, like the one below. are more traditional and lots of people suggested them for us. 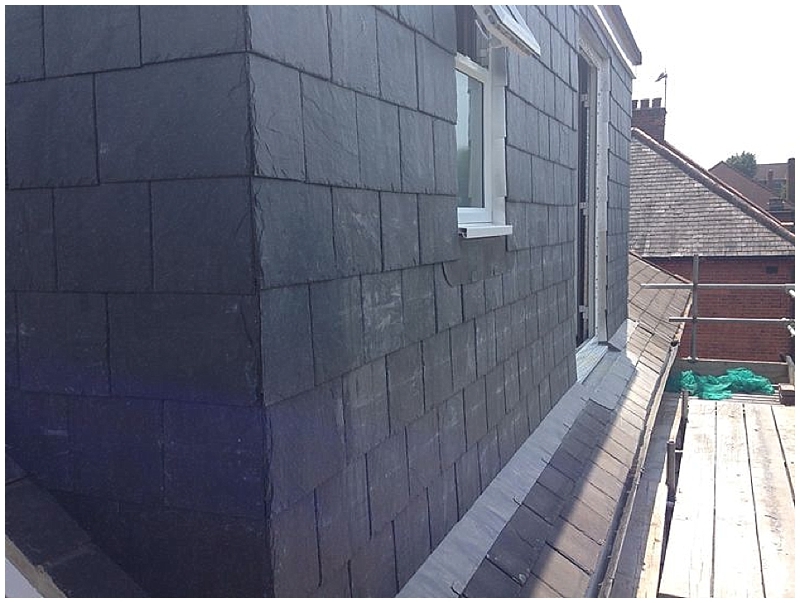 But, we have SO many slates on our complicated roof, if felt like slate overkill to have them on the sides too. It was just too…. obvious. Plus, no contemporary edge. The option of horizontal timber or ‘pretend’ timber was also an option. If I’d painted timber in dark grey that would have looked good but also taken ages and been hard to upkeep. I didn’t really like the idea of a plastic or hybrid product either, plus there was the danger it could look a bit seaside like and we are in Manchester, quite a way from any beaches! A very flat and modern GRP (today’s fibreglass) effect as below in cream or grey was considered too but it just looks a bit too characterless for my house. On new builds yes, but I wanted a touch more detail. 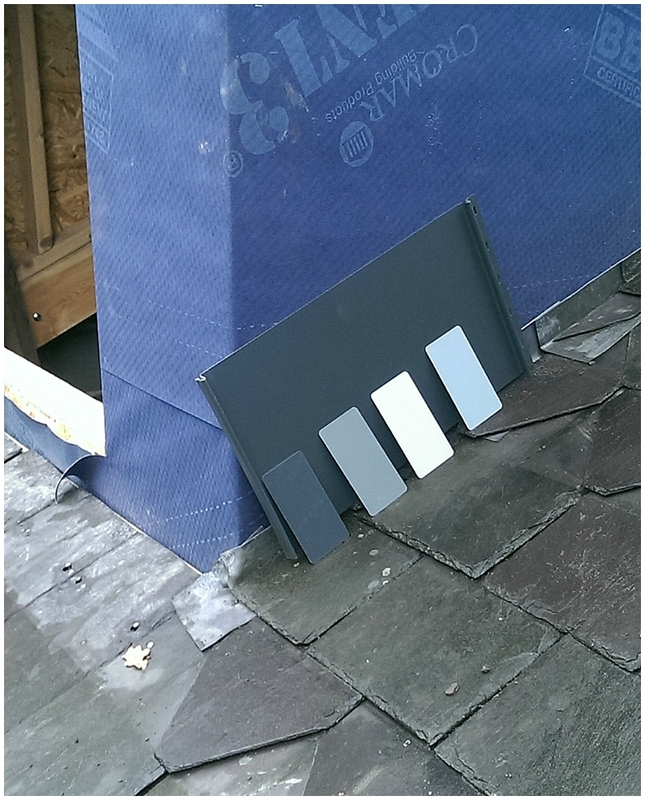 What about lead work clad dormers? Well, quite apart from the fact I’m all leaded out after the valleys and box gutters, I didn’t want something which would weather and change. 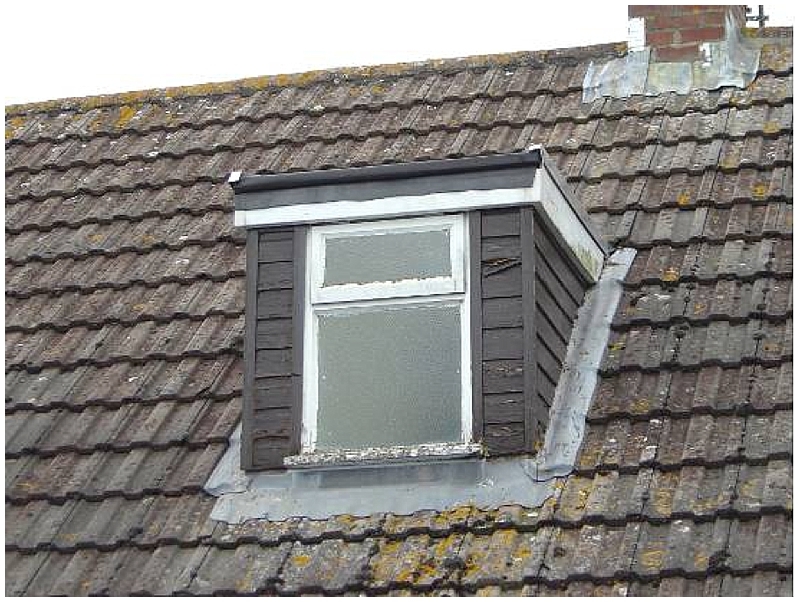 I’ve watched the lead work tarnish here and didn’t want that effect on all four dormers, it just looks a bit DIY to me. 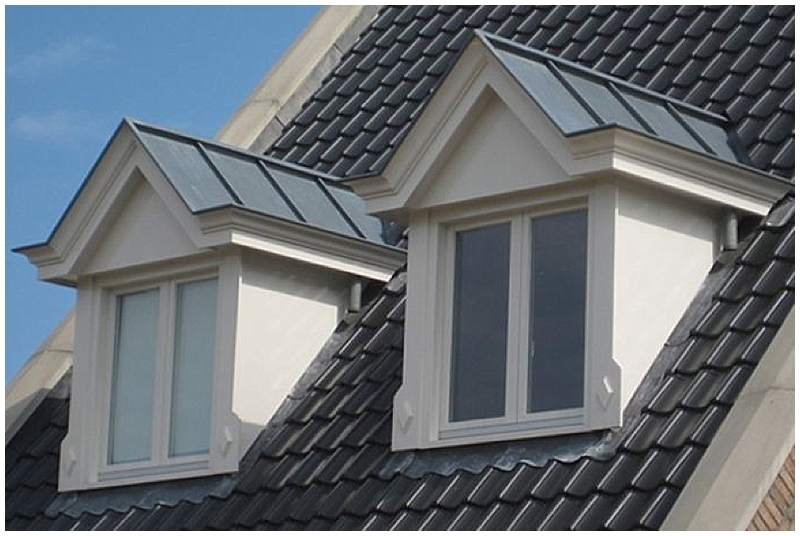 Yes, you could have glass sided dormers. No, I didn’t seriously consider them for a single moment. Is your build traditional or contemporary, or a mix of the two, like mine? What colour will be best? 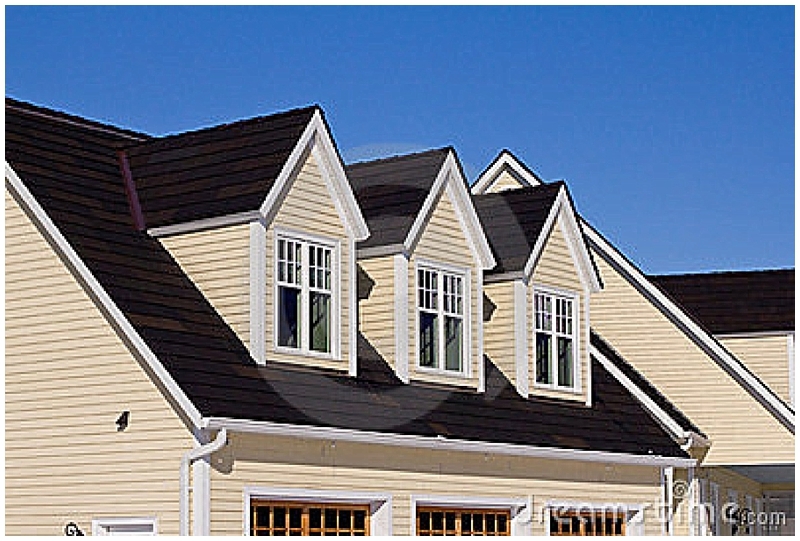 Do you want your dormers to blend in or stand out? 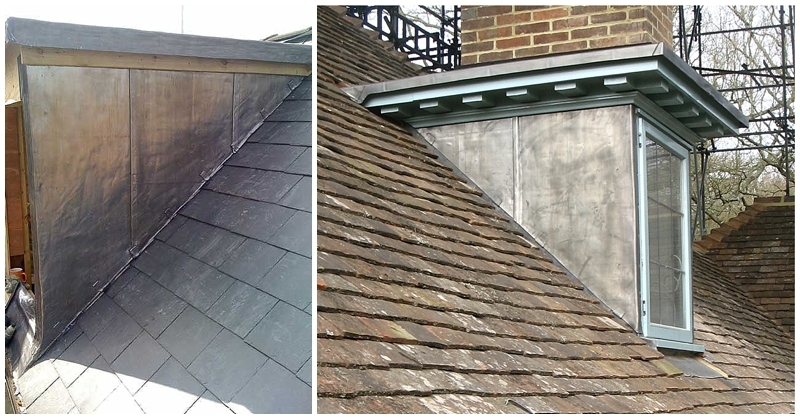 Is your dormer easily accessible – maintenance is a huge consideration. Longevity – is the product durable? Is the product or the installation guaranteed? Is sustainability important to you, can the product be recycled? Take note of where you live and which direction the dormer faces, some materials are better for exposed areas and bright constant sunshine for example. One final point. 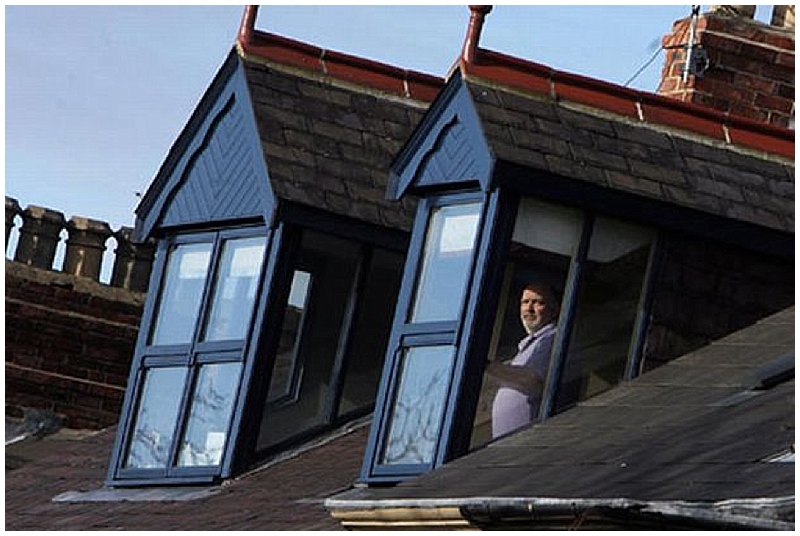 Here is the example which drove me in my quest for dormer perfection. Can you EVEN imagine this on your home?!! Love the Colour and material, the pictures really help with imagining what it will look like, good luck with it all it looks fab. Thanks for write up – useful!